Mississippi Museum of Natural Science held a Family Fun Science Night on Thursday, January 18, 2018. 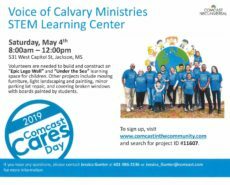 One of the advertised activities was to see STEM/STEAM demos, which is where Voice of Calvary Ministries (VOCM) fit perfectly into the evening’s program. Ms. Debra Raddin, co-founder of the Mississippi College STEM Institute and education development consultant, staffed VOCM’s table where she demonstrated, with the children’s participation, thatSTEM/STEAM (Science, Technology, Engineering, Arts and Mathematics) education is about real life, hands on learning that naturally encourages the development of nurtured thinking. This includes observation skills, problem solving, and connecting formerly separate areas of information to come to new understandings and ways to apply them. The two learning projects that children enjoyed participating in were the Tower Building Challenge and the Roller Coaster Marble Race. The Tower Building Challenge’s goal was to construct the highest free standing tower of any built during the Family Fun Night. 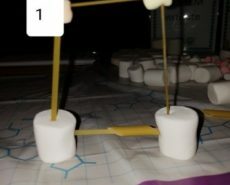 Construction materials were spaghetti (uncooked of course) and large and small marshmallows. Children participating in this activity interacted with math and engineering concepts such as the effect of angles on structure strength and materials strength. The participant with the tallest free standing tower received a prize. We are thankful for Mandy’s joyful and capable volunteer help for VOCM’s evening at the Museum of Natural Science. Here Mandy is helping with the Roller Coaster Marble Race. The Roller Coaster Marble Race’s goal was to find the fastest route for a marble to travel through a tunnel made of foam pipe insulation whose sections and course direction were secured by duct tape. There were a lot of different tunnel configurations made up by participants. Each time a new tunnel configuration was completed the participant let the marble go at the top of the tunnel and the time it took for the marble to reach the bottom was recorded. Children participating in this activity got to interact with physics principles such as speed, mass and velocity. The child with the shortest course completion time received a prize. Joining Ms. Raddin were Ms. Lynn Weathersby, STEM teacher at Florence Middle School and her daughter Mandy.